HTM Manufacturing specializes in providing a complete line of economical heat transfer mastics, heat transfer cements and the required accessories for installation of steam, fluid and electric heat tracing systems for industrial applications. Our heat transfer mastic (cement) formulations are designed to significantly improve the heat transfer rates between external heat tracers and the process pipes and equipment requiring heat. 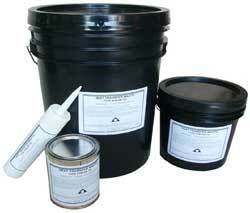 Heat transfer mastics (cements) thermally bond the heat tracers to the process pipes and equipment. The mastics fill the air cavities that normally exist between the heat tracers and the process pipes with mastic cement that efficiently transfers the heat through conduction to the process equipment. This conductive mastic or cement will transfer heat at a rate of up to 10 times that of convective (air) heat transfer rates. One (1) tracer installed with HTM heat transfer cement will deliver the equivalent heat of up to four (4) bare (no HTM) tracers. The elimination of multiple tracers, steam supplies, steam traps and the costs to install and maintain the tracing system is greatly reduced. The key to any well performing heat transfer system is the design and specification of the correct material to enhance performance. HTM Manufacturing is ready to assist you in sizing and specification for the best system. Our field sales representatives have extensive practical experience to assist you in your local area.